Below are my top 10 twitter tips for law firms and solicitors looking to get the most from twitter. For a comprehensive list of the top 50 reasons why law firms and lawyers should be on twitter, see my good friend Michelle Hynes-McIlroy’s blawg. For more detailed tips, of which there are many, I would strongly encourage you to look at Brian Inkster’s The Time Blawg’s post on the Law Firm Twitteratigate and comments therein. 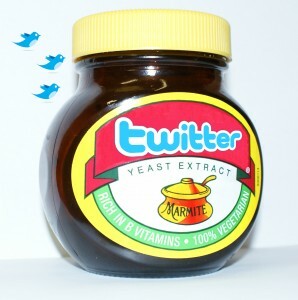 Twitter Marmite image courtesy of a great twitter blog post from LandingNet. Comments welcome below. Nice tips Gav. I think a lot of people think that simply posting updates on the firm etc is enough. What they don’t realise is that they must engage with other tweeps to become effective. On this note particularly liked tip 4. Thank you Victoria. Agreed that simply posting updates from the law firm website is not enough to become as effective as most law firms deserve. Contribution should be key. If the major law firms are managing to contribute to official consultations regardign the laws of the country then they should also be able to engage more through twitter. I reckon that if you look at the number of mentions received, a law firm that simply posts updates will get fewer exposure than one that engages. And if a law firm doesn’t think that mentions are important, consider the hundreds of thousands of extra followers on that other person’s account that will see at least the brand name of the firm, never mind the message. Hopefully things shall change more in 2011. I would, however, reaffirm that a number of large law firms, e.g. in Scotland, are managing to engage well via twitter, such as Biggart Baillie, Burness, Brodies and Harper MacLeod, to name a few. Hopefully the momentum keeps going! Brilliant to see a top ten list and thanks for mentioning me I must say that I do not #ff @ffhelper. I have never used it don’t plan to. The trend of recommending people on a Friday is one which has organically grown over the last few months and the purpose is to recommend to your followers people who YOU recommend. @ffhelper is an automated list .It picks up on the people you RT the most. That does not necessarily follow for me that I want to recommend them to my followers. Many people on twitter post great links and I RT them because the content will be of interest to my followers but some of those do not engage with me hence why on earth would I choose to recommend them. I may also have been RT someone for weeks then all of a sudden they start to tweet posts that are dubious It does happen and the ffhelper only looks at numbers not content. Instead If I DO chose to recommend people of a Friday everyone can rest assured that my #ff are people I have hand picked, considered the content of their tweets and how much they actually engage and I must say I don’t always get round to doing it every Friday. I personally would much rather recommend people personally than rely on a list creator. After all you wouldn’t refer a law firm just by plucking a list from the yellow pages would you ? For me Twitter is not about the number of followers I have but instead about the type of followers I have. Anyone can sign up to one of the programmes that follows people and follows back and thus you see accounts with hundreds of thousands of followers. I fail to see the point in this at all apart from a broadcasting perspective and maybe thats ok if you just want to put out a message but many of the Lawyers and students on twitter are using it for the purpose of a two way forum with the aim to build their circle. I welcome your tips Gavin but reiterate – take time to recommend if you do decide to take part in the follow Friday trend. You don’t have to. Create your own topic of recommendations – Top Tuesday Lawyers, Wonderful Wednesday tweeters, Thoroughly unmissable Thursdays. And If you really want to make twitter work for you keep it real. ffhelper is a lazy automated way to do this and only generates more followers for ffhelper. PS I always look at #ff and if it says created with help of ffhelper I don’t follow any of the recommendations. Thanks Michelle! I hope many comments and some good quality discussion emanating from this, perhaps with additional tips that I have never heard about before! I absolutely agree that @ffhelper is not the optimum way of giving out #ff recommendations on Fridays or, indeed, any other day of the week as it is not as social as this form of social media demands. Nevertheless, for those lawyers who don’t have much time to spend doing it, I would suggest that it is still much better than doing nothing at all #ff-wise. Further, agreed that if the purpose of using #ff is just to create a greater following, make sure you still continue to connect with these people. At the end of the day, you could have hundreds of thousands of followers, but you can only really hope for optimum discussion, contribution and recognition (in the form of retweets, mentions or views of your website’s pages) if you engage with a lot of the people you are following. I would reiterate that I have only started tweeting since the middle of last year, so I am by no means an expert in this field but I have made many mistakes and learned lots of lessons, such that my time spent on my twitter accounts or any clients’ twitter accounts is not wasted time. Thanks again for your expert comments Michelle. Looking forward to more views on whether @ffhelper should be avoided where possible. Thank you for the mention for @biggartbaillie. We’ve talked before when it comes to following accounts whether law firms/lawyers should follow their peers and I say yes! As far as I am concerned you can keep up to date with what others are focussing on and conversely been seen by others. Any issues with conflict? Therein lies the solution. Imagine your firm was approached by someone to do work and there was a conflict – who would you want to refer them to – someone who you are not sure of / only worked with on a few occasions or someone who you know, through Twitter, is knowledgeable, clued up and active in that sector? Absolutely! The hope of course is that the other firm would reciprocate. As for #ff, I am of the same opinion as @legaleagleMHM in that #ff should be personal and I try to do that with my own account but can understand the logic behind having it set up for a firm account(s). You’re welcome Jane. Great to hear comments first-hand from the expert inside the social media engine room at Biggart Baillie! Conflicts of interest are indeed a great reason why law firms and lawyers should not be too timid when following or indeed engaging with their peers through twitter. This is particularly the case in Scotland which has such a tight community of law firms and lawyers. “Imagine your firm was approached by someone to do work and there was a conflict – who would you want to refer them to – someone who you are not sure of / only worked with on a few occasions or someone who you know, through Twitter, is knowledgeable, clued up and active in that sector? Absolutely! The hope of course is that the other firm would reciprocate.” – exactly! Good luck with @formulists, first introduced to me by @mikejulietbravo and thanks again for posting! In addition to some of those of the larger Scottish law firms mentioned, it is also appropriate to mention some of the smaller Scottish law firms who have been using twitter well for business development purposes recently. David Morgan, Head of Dispute Resolution at Burness LLP, notes that the Twitter feed works well on the Burness LLP homepage, mainly because it keeps the site dynamic. This is a major bonus point for search engine results. David notes further that twitter has worked for his team and firm with recruitment, although in terms of client wins and driving business, Linkedin still seems to come out on top. Perhaps things will change in 2011/2012 with twitter becoming more integrated with Google search results. Nevertheless, to be fair, Linkedin now has an “open group” option, bringing it more akin to sites like Quora. Would be good to hear updates in terms of client wins later in the year. If you are not already following David, I would suggest you do so here http://twitter.com/davidmorganllb. Jane Clemetson recalls @legalbrat having used twitter to recruit a candidate for maternity cover purposes. 3. Because of my blawg post on international private law and human rights in the courts, I have received two phone calls asking for legal advice. The first time, a Glasgow entrepreneur and hotel owner phoned looking for advice despite having his own legal representation from a well-known firm of solicitors in Glasgow. While discussing the IPL considerations generally, the advice given was that he should revert back to his solicitors. Second, a woman in the West End of Glasgow spotted me both through a Google maps search and through my blawg article. Her query regarding an interim interdict in Glasgow Sheriff Court was handed over to Harper MacLeod via my contact at @Connect2Law with whom I had spoken both via twitter and linkedin.